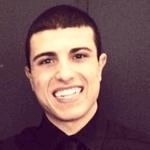 Meet Matthew Giordano, a happy DAT Bootcamp customer who recently conquered the DAT. 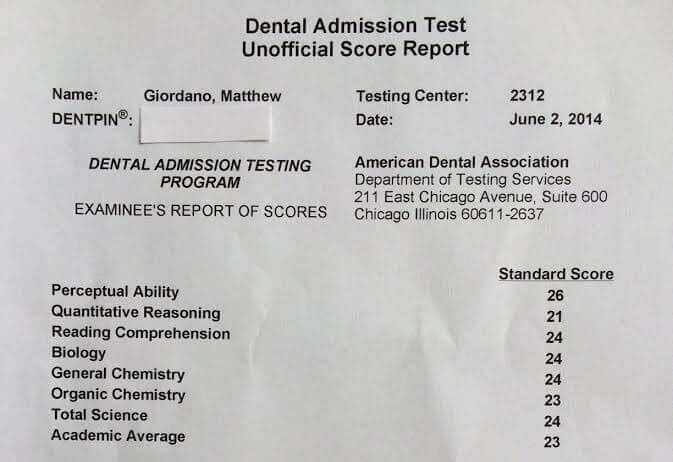 I’ve asked Matthew to share his DAT experience with us as the featured student of August. What is one piece of advice you would give to another student preparing to take the DAT? My biggest piece of advice for students preparing to take the DAT would be to not get overwhelmed. Before you start studying, come up with a study plan and a strict study schedule and stick to it. I told myself I had to get through a certain amount of material each day, and setting that goal really makes it possible to get everything done that needed to get done. I never looked at the same subject for more than a couple of hours at a time. Next, don’t be freaked out by the occasional low score on a practice test. It may be overwhelming to see a score you aren’t happy with, but use those practice tests as learning tools to see what went wrong and make a point of avoiding those same mistakes. Finally, the day before your exam, relax a little bit. Don’t be like me and try to study everything the day before. I found myself forgetting easy things and questioning whether or not I actually knew the material. I do, however, advise doing a bunch of PAT practice problems the day before so you know the little tricks to look out for on your actual exam. How did you use DAT Bootcamp to prepare for the DAT? 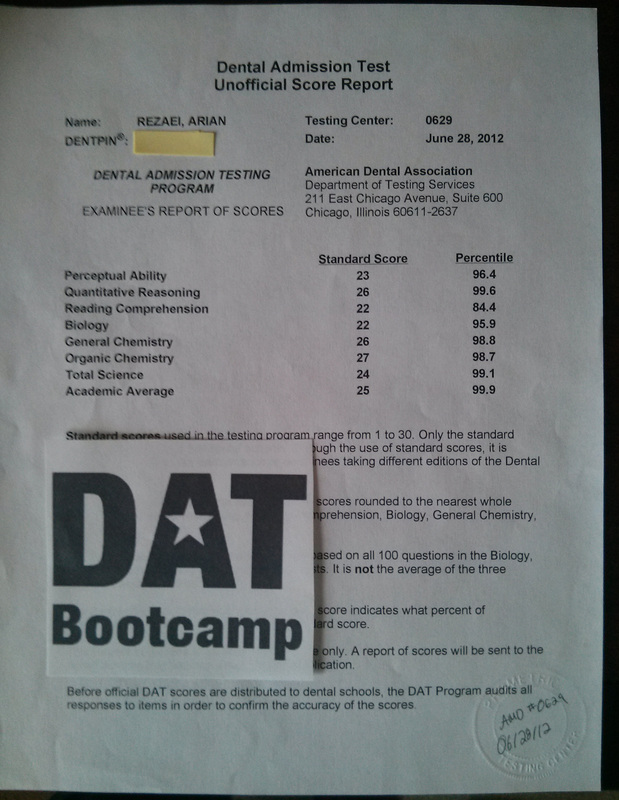 Three weeks out from my exam, I began taking one or two DAT Bootcamp practice tests per week. I simulated real testing conditions by doing each section one after the other. My system was to take one practice test, quickly write down the number and letter of any incorrect answers, and move on to the next section. I did this for all six sections, and then went back at the end to see what I did wrong and make detailed notes. To get back to all of the solutions, just start the test again, go to the last question and submit the exam. This is why I wrote down my wrong responses so I could avoid having to re-enter all of my answers each time. Even for the correct responses, I made sure to read DAT Bootcamp’s explanations to make sure I truly understood the material. During my last week of studying, I went through all of the science exams again. What would you do differently to prepare for the DAT? If I could do anything differently, I would not have put so much pressure on myself. I gave myself 5 weeks to study, immediately following the end of my finals. It was good to still be in study-mode and have a strict schedule to follow, but studying all day, every day, for 5 weeks probably isn’t the best way to study. I wish I would have given myself some time to relax, just even one day a week off. Factor in “days off” when scheduling your exam. You will seriously thank yourself. Also, I wish I would not have panicked during the quantitative reasoning section. I knew my score would be coming up soon, so my heart was pounding and I could not focus. If you have a minute between RC and QR, breath for a minute, relax, and calm yourself down. If you have any questions or need advice, feel free to message me on SDN. My username is mjgio104. My score breakdown: 23 AA, 24 TS, 24 BIO, 24 GC, 23 OC, 24 RC, 21 QR, 26 PAT.